There are so many things I love about winter from the fairy lights on the tree to the crisp frosty mornings and hot chocolate under a blanket in the afternoons. I hate how cold it gets on the school run though, how my feet never quite feel warm enough and how dry my skin gets. Long walks in the sharp winter strip my skin and the central heating and hot baths which I very much rely on seems to dry out what is left and whilst I use very few products in the summer, it is a different story in the winter. I have always had to be careful with what I use on my skin as I had bad eczema as a child and I am still prone to flare ups. 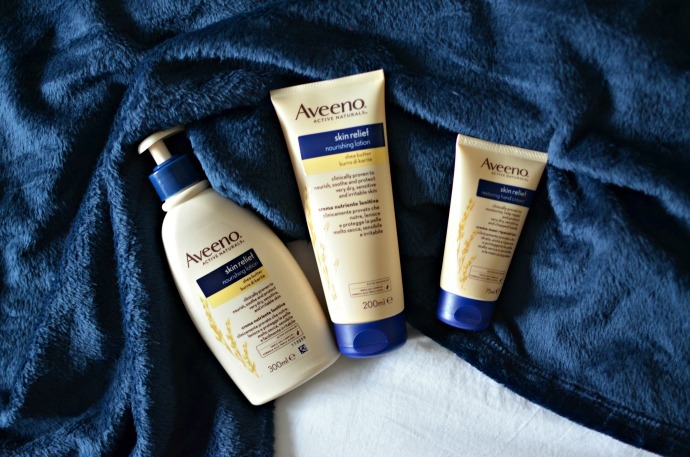 Aveeno® Skin Relief Nourishing Lotion and Restoring Hand Cream are gentle on my skin with its triple oat formula and they sent me a lovely hamper to help look after my skin this winter. I have buggy mitts to keep my hands protected from the wind when we are out walking and AVEENO® Skin Relief Restoring Hand Cream for restoring moisture and keeping them silky smooth. There is nothing worse than dry hands and the 75ml tube is perfect for popping in my handbag to use on the go! bedroom. It is clinically proven to moisturise skin for up to 24 hours and help to prevent that tight irritable sensation of dry skin. 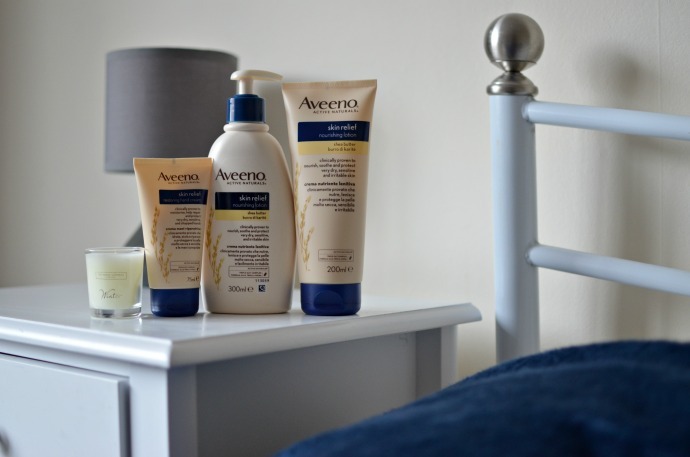 We already have the new AVEENO® baby range for the little ones and I am enjoying focusing on myself a bit more this year too, looking after my own skin as well as I look after theirs. None of the children see bad weather as a reason to stay outside so if my winter is going to be spent at parks and the beach then my skin definitely needs a little bit of TLC!